I haven’t really thought much about Basement Cat’s tendency to put toys in his water bowl. Foam balls squeeze out easily, mylar balls shake out, both dry quickly. It was rather nice, in fact, to think that Basement Cat was engaging in ordinary cat play instead of pursuing drug deals. But today the water bowl contained a toy mouse. Basement Cat swears it was an accident. The mouse went for a walk in wet clumping cat litter (well, someone should scoop more often, poor mouse! ), and then overbalanced and fell into the water bowl. Yesterday my Kalamazoo paper was 2/3 written. Now it’s only half-way there, though I haven’t cut anything. How can this be? Someone withdrew from my session. Basement Cat is calming down and can manage to spend a couple of hours in the presence of other cats without committing mayhem, so long as he’s supervised. He does get bored cooped up in my study with me. Last week I had what I thought was a bright idea: I got out the harness that belonged to the beloved-and-departed tabby, strapped it onto Basement Cat, added some string to lengthen the leash, and tied it off to my belt. I figured that would let him explore the upstairs, while allowing the other cats to stay out of his range if they wanted to. Of course he tried to back out of the harness for a few minutes, but then he settled down and seemed to get the idea. He bounced around testing limits and poking into corners, and then I heard him go into the bedroom and jump on the bed. All was quiet. I became absorbed in research for my Kalamazoo paper, tugging on the string once in awhile to make sure Basement Cat was still napping on the other end. Indeed he was not. He had cleverly stuck the string under a baseboard so I would feel some resistance, wiggled out of the harness, and gone marauding. Fortunately he was too fascinated by the basement to beat up any of the good cats. No, not that one. I’m wondering if you have used Rob Pope’s How to Study Chaucer in class, and if so, whether it helped. I’m considering it for the fall, mostly because a lot of the things he says are things I say, and sometimes students find them more authoritative if they’re in print, not to mention a more convenient resource in the middle of the night. On the other hand, while the approach may be too simplistic for good students, it’s sufficiently text-dense as perhaps to be off-putting for those most in need of help. And it is aimed primarily at British students who are going to have to take exams rather different from what we’ll be doing in my classes. Hence my bleg. Thanks for any comments! I think it’s taken 15 hours. Maybe more. And now that it’s done, I think most of my clues are pretty lame (either too easy or too obscure), and some of the Middle English is seriously tortured (because BD has way too many significant names with awkward letters like U and C), and there are too many answers that don’t really have anything to do with either ME or BD, because when you’re trying to fill a grid with words like those already alluded to, you can’t get too picky about what goes in the background, so to speak. But it is done! And I’m hoping for some help from my Gentle Readers: who’d like to do some beta testing and skip a day’s class prep? E-mail me, and I’ll send you the puzzle, and you can send corrections / comments / suggestions. I don’t usually feel that I need to be told not to put too much time into teaching. I mean, of course I try to prepare interesting classes and good assignments, but I don’t spend 45 minutes grading a single paper or write comments as long as the paper itself. But I had an idea recently about using crossword puzzles to teach Middle English vocabulary. And to reinforce facts about Chaucerian texts. And since I am a word-puzzle geek (acrostics, anagrams, Boggle, crosswords, cryptics, Lexulous, Perquackey, Scrabble), I didn’t think it would be that hard to create a puzzle of my own. A fun challenge, sure. At 2:30 a.m. last night, I finally put the graph paper down and went to bed. Not finished, oh no, never think that. I had had a whole corner done at one point, if I accepted two-letter words, but I decided I wouldn’t do that. I got a bit farther today, having worked out some principles yesterday; it also helps, I think, to have expanded the grid a little. But as great as I think it is to have a crossword puzzle with a Book of the Duchess theme and many of the answers in Middle English, this is the sort of thing that no one will ever appreciate or give me credit for. Students will probably think there’s a web site where professors can download puzzles based on the Chaucerian work of their choice. My colleagues will have no idea how long it takes to do this, or why anyone would want to bother. This is not a good use of my time. You can be helped. No one has to get hurt. Put down the pencil and graph paper, and back away slowly. The responsible, adult thing to do would be to work on The Paper That Will Not Die (TPTWND). I might even be able to kill it off today. I want to go get my hair cut. Sir John claims he’ll come home early so we can have drinks together in the late afternoon. So I should go to the gym before then. Which doesn’t leave a lot of time for sneaking up on TPTWND with my ninja-like footnote attacks. So I should do that now, instead of getting my hair cut. Since I still have some coffee left, maybe I could stand to work till it’s done. Also I should let Basement Cat out for interaction with the others, which still has to be supervised (but Prozac has helped him a lot). If this were first adolescence, I’d be staring at the clock in chemistry, or watching my lab partner set a test tube rack on fire. Maybe I can bear another round with TPTWND. Maybe Basement Cat is my new lab partner. I decided to embrace the idea of a second adolescence, suggested by Meg in a comment to my last post. It made for a good weekend (especially since I don’t have to worry about getting carded any longer). Friday night I drank too much. Saturday I got my face painted, and then went to my favorite second-hand CD store and acquired some stuff I used to listen to, but had more-or-less forgotten about. I also visited the bead store that reminds me of the one where I spent a lot of time about 32 years ago. 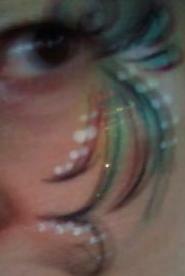 Face paint made young men want to talk to me; one complained about his father’s reaction to his mohawk. Had I only realized that 30 years ago . . . oh well. Too soon old, too late smart. I spent a lot of my original adolescence in my room, reading, rather than attracting the attention of misunderstood young men. Now that we mention it, not much has changed. A couple of days ago I found an old shirt of Sir John’s, one I’ve never seen him wear, and adopted it. I like the dark red stripe. I used to be pleased at how much I’d changed since high school. I got contacts, cut my waist-length hair to about 3 inches long, acquired a closet full of silk shirts and tailored skirts, trousers, and blazers to wear them with. I looked like a grown-up. A couple of years ago I got bored with short hair and started growing mine out, so I could put it up and play with it. A French twist, with graying hair, looks very professorial. Before going out in Sir John’s shirt, I checked the mirror. Long hair, glasses, jeans, guy’s shirt: anyone I went to high school with would recognize me instantly. It’s not that I haven’t changed since then, but here I am, changed back.